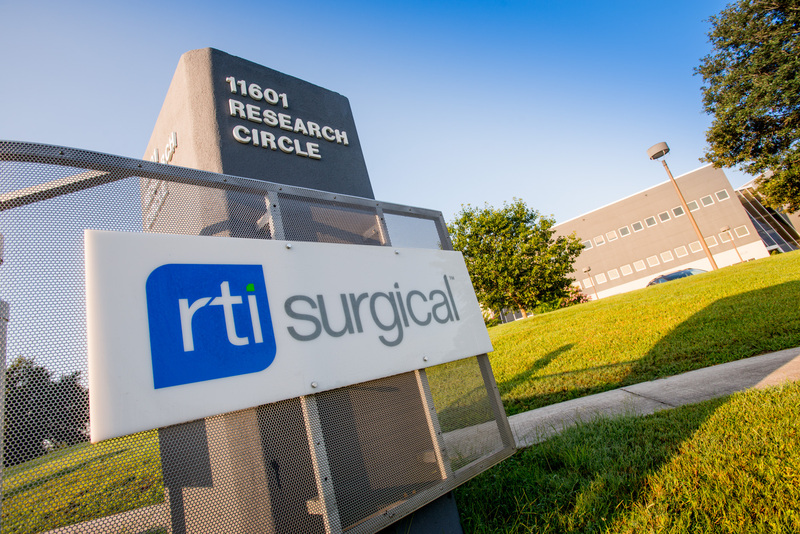 RTI Surgical Reaches Global Milestone of Providing 8 Million Biologic Implants with Zero Confirmed Incidence of Implant-Associated Infection - RTI Surgical Holdings, Inc.
ALACHUA, Fla. – April 4, 2018 – RTI Surgical, Inc. (Nasdaq: RTIX), a global provider of surgical implants, celebrates a significant global milestone of providing more than 8 million biologic implants processed through RTI’s proprietary sterilization processes with zero confirmed incidence of implant-associated infection. In 2017 alone, RTI distributed more than 600,000 biologic implants—helping surgeons serve patients in nearly 50 countries. RTI celebrates these milestones and marks its 20th anniversary of delivering trusted surgical implants during National Donate Life Month in April. RTI has a proud, 20-year history of “firsts” in biologic surgical implants. It is recognized for initiating and elevating standards for the tissue banking industry, including being the first to introduce tissue-specific validated sterilization processes — the BioCleanse® Tissue Sterilization Process, the Cancelle® SP DBM Sterilization Process and the Tutoplast® Tissue Sterilization Process. It was also the first to offer precision-shaped bone implants and assembled technologies. Our world-class facilities in the U.S. and Europe provide a combined 250,000+ square feet of manufacturing for these advanced technologies. RTI’s tissue-based implants are used in surgical procedures such as, anterior cruciate ligament reconstruction, meniscus transplantation, fracture repair, rotator cuff repair, wound coverings, post-mastectomy breast reconstruction and abdominal wall repair for hernias. RTI joins Donate Life America in celebrating National Donate Life Month and encouraging Americans to save and restore lives by registering as organ, eye and tissue donors at www.registerme.org. RTI Surgical is a leading global surgical implant company providing surgeons with safe biologic, metal and synthetic implants. Committed to delivering a higher standard, RTI’s implants are used in sports medicine, general surgery, spine, orthopedic, trauma and cardiothoracic procedures and are distributed in nearly 50 countries. RTI has four manufacturing facilities throughout the U.S. and Europe. RTI is accredited in the U.S. by the American Association of Tissue Banks and is a member of AdvaMed. For more information, please visit www.rtix.com. This communication contains forward-looking statements within the meaning of the Private Securities Litigation Reform Act of 1995. These forward-looking statements are based on management’s current expectations, estimates and projections about our industry, our management's beliefs and certain assumptions made by our management. Words such as "anticipates," "expects," "intends," "plans," "believes," "seeks," "estimates," variations of such words and similar expressions are intended to identify such forward-looking statements. In addition, except for historical information, any statements made in this communication about anticipated financial results, growth rates, new product introductions, future operational improvements, gaining market share and results or regulatory actions or approvals or changes to agreements with distributors also are forward-looking statements. These statements are not guarantees of future performance and are subject to risks and uncertainties, including the risks described in public filings with the U.S. Securities and Exchange Commission (SEC). Our actual results may differ materially from the anticipated results reflected in these forward-looking statements. Copies of the company's SEC filings may be obtained by contacting the company or the SEC or by visiting RTI's website at www.rtix.com or the SEC's website at www.sec.gov.